As I recently clicked through the Twitter feed for the Urs Fischer show, I came across a tweet by Galen Pehrson, an artist/streaker who obviously loved the show. He tweeted: Urs Fischer show best enjoyed naked and jumping, and included a photo of himself streaking naked through the crowd-sourced assortment of fired clay pieces on exhibition. Pehrson, by the way, has executed two recent video commissions for MOCA: one for the current REBEL exhibition, and another for MOCAtv. Artist Galen Pehrson (@Cagedpillow) photographed by Jena Malone (@MaloneJena) OK, that looks like a lot of fun but it got me thinking about a paradox. MOCA has now become a place where you just might see a live naked person but it is very unlikely that you might see a painting of a naked person there, especially one executed with real skill. 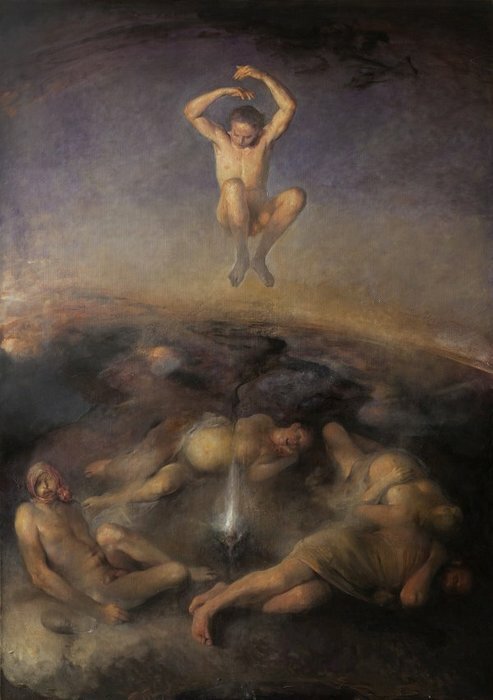 Marina Abramovic's live human centerpieces have been seen there (at MOCA's December, 2011 Gala) but Odd Nerdrum's masterful paintings of human figures have not. Since it opened in 1983 MOCA has certainly shown representational paintings -- Suzanne Caporeal had a nice mini-show in the summer of 1985 -- but an invisible art world line has screened out whole genres of painting, most notably realism and other approaches that have their foundations in skillful drawing and rendering. In true country club style MOCA's curators must have been quietly rationalizing this exclusion:"The other museums can show those artists...and they aren't contemporary..." In the comments at the end of this blog would someone please explain to me why, for example, a great living realist like Antonio López García can't be shown in a contemporary museum? Like other leading American and European contemporary museums and galleries, MOCA has narrowly defined contemporary to mean works that have their roots in Duchamp, Warhol and postmodern theory. If you feel, as I do, that Postmodernism officially expired when Paul McCarthy's giant inflatable turds deflated in Hong Kong this May, you may share my view that a new point of departure is needed. If anything, MOCA's soon-to-depart Director Jeffrey Dietch accelerated the museum's trajectory towards an atomized, novelty-driven form of Postmodernism. As Tulsa Kinney of Artillery magazine put it in an editorial reflecting on the sacking of curator Paul Schimmel and Director Jeffrey Deitch's imminent departure: MOCA made a mistake. They traded substance for glitz. MOCA, as it prepares to choose a new director and hopefully hire at least one new curator, has a great opportunity at hand to renew and broaden its curatorial vision with an infusion of substance. Paul Schimmel was a powerhouse but even his vision had its perimeter when it came to representation. Wouldn't this be a fantastic moment for MOCA to woo back the respect of its public and ally the suspicions that it has become a display window for its trustees and their dealers? It would also be a chance for the museum to reach out to some of the L.A. based representational painters who long ago gave up any hope of receiving a phone call from a MOCA curator. To reassert its identity as truly progressive institution MOCA's future plans could and should include showing what the the Hammer and the soon-to-open Broad Museum won't be showing in the coming years: an all-encompassing range of contemporary representational paintings. Interestingly, and somewhat ironically, one source tells me that Jeffrey Deitch had quietly been working to craft a show of New Figurative Painting prior to the announcement of his departure. If this rumor is true I say good for Deitch and I hope the exhibition comes together. MOCA's next director should plan on hiring a chief curator who is knowledgeable about and friendly towards representational painting. What a fresh, challenging statement that would be: the conversations about MOCA around town would instantly be turned upside-down and inside out. Isn't that part of what MOCA was always meant to do? Would I expect MOCA's entire orientation and program to suddenly make a U-turn? Of course not. What I am proposing is that MOCA add challenging new flavors to its future programmatic recipe. To give this conversation more specificity -- and to help MOCA's theoretical new Head Curator plan some shows -- I am appending an alphabetical list of living, working painters whose work would look splendid at MOCA. I have purposely omitted some artists who are already well known to Southern Californians: Wayne Thiebaud and David Hockney for example. The 40 artists who appear on this list are individuals, and this list has no hierarchies or priorities. Their names have been culled from over 135 suggestions that were given to me. I made the final selections based on my subjective views, whims and caprices. If your name or the name of an artist you suggested is not on this list keep in mind that the omission may reflect inadequate caffeine in my bloodstream at the time I was making selections. Hopefully you will still share this blog and show your support for the artists who are listed. Because of the difficulty that would have been involved in posting a large number of images I have simply linked each name to the artist's personal website, or a site containing examples of his or her work. I would very much like to thank my Facebook friends for helping me assemble this list. Like Urs Fischer I know that crowd-sourcing is a great way to get things done. John, I'm touched and honored to be included on your list. Let me know if there's any way I can contribute to making your excellent* proposal a reality. *There is a possibility that I am biased, but it's still excellent. Hi Daniel, I'm glad you are pleased. I'm hoping that both those on the list and those who I did not include will circulate this blog and help it make the point that representational art is ready for the spotlight in leading museums. The Huffington version of this seems to be all over Facebook. I'll post it to my blog sometime soon as well - a strange reticence has always restrained me from writing blog posts about accolades, shows, and publications; sometimes I can fight it enough to link a really wonderful item like this. I'd be interested to read more from you on when something qualifies as ready for such a spotlight. If you have prior writing going into more detail, please direct me, and if you cover it in the future, again, I'm very interested in the criteria of evaluation you apply. but why is there no modern african artist on this list? take a historic time frame from nigeria,the decade of the 1960s independence era unto the threshold of the 1980s. y.c.a. grillo; david herbert dale and the most cited modern nigerian artist k. el. anatsui: these meet a criteria for analysis.